SANDAG recently used its newfound authority under AB 805 and called for a weighted vote, which allows a minority of board members, who together represent a majority of the county population, to overrule the rest of the board. The move didn’t go over well with mayors from some of the region’s smaller cities. Now, as VOSD’s Andrew Keatts reports, it turns out that was actually the second time the controversial weighted vote was put into play. 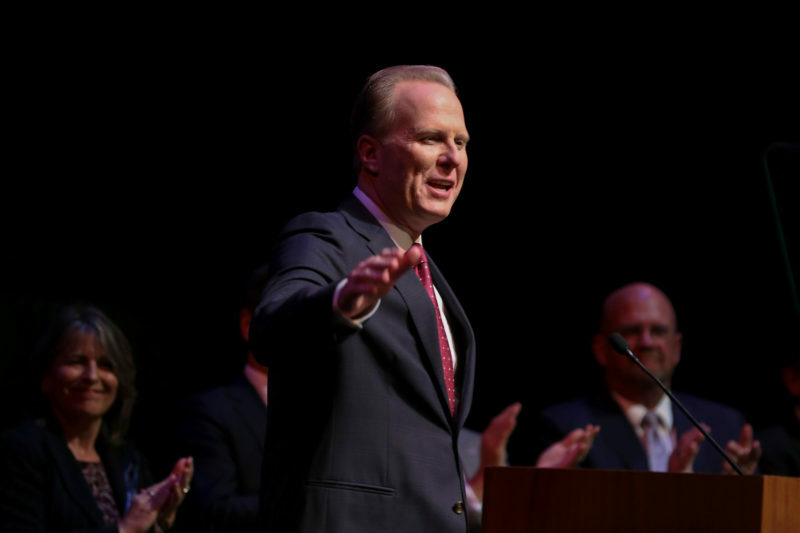 Mayor Kevin Faulconer called for a weighted vote in a May 11 closed session meeting. The mayor effectively used the authority to block the board of directors’ attempt to hire a new executive director. Why did Faulconer do that? The SANDAG director vacancy was created when the longtime agency head stepped down last year in a scandal revealed by a Voice of San Diego investigation. Before Faulconer blocked the move, the board had wanted to hire the agency’s acting director. But she was closely involved in the agency’s response to the investigation’s revelations. Why this matters: There are big changes underway at one of the most powerful government bodies in the region.This is all very new for SANDAG. Prior to this, the agency had operated with a bewildering unanimity. Also of note: Faulconer had for the majority of his mayoral tenure almost never even attended SANDAG hearings. He has now in successive meetings made a major play to change the direction of the agency’s decision-making. It is a new day. What’s next: SANDAG’s next meeting is Friday. The board is expected to finally reconsider its decision to lobby the state for less stringent housing requirements. Unless some officials have changed their minds in the last few weeks, overturning that decision will once again require a weighted vote. We’ll see if the smaller cities on the agency’s board decide to flex what muscle they have by withholding a quorum so the board can’t make any decisions at all. In April, water officials across Southern California seemed to cross a finish line on a massive water project they’d been working on for decades. The Metropolitan Water District of Southern California voted to pony up $11 billion to help build a pair of tunnels to bring water south from Northern California. embarrassing setback for the agency and the Brown administration. The agency also released text messages and other internal documents that show how Metropolitan officials put the deal together. They shed light on how water officials are rushing to advance the project far enough that it would be hard for a future governor – namely Gavin Newsom – to kill it. We’ve been covering the tunnels for a few years. For a long time, the San Diego County Water Authority wanted a new north-south water project, until suddenly it became the leading skeptic of the tunnels. That all changed a few weeks ago when, out of the blue, the Water Authority decided to support the tunnels project, seemingly severing its ties with environmental groups opposed to the project. In April, when it looked like the financing was finally in place for the project, we explained what the vote meant. Now, we’ll need to wait until July to know if that vote will stick. To deal with the crush of new cases spurred by Attorney General Jeff Sessions’ “zero tolerance” policy, U.S.authorities are looking to introduce a fast-track prosecution program for those who cross the border illegally into California, the Los Angeles Times reports. The program, called Operation Streamline, will move migrants through the criminal justice system in group hearings – ranging from 35 to 100 people a day – where their cases, from arraignments to sentencings, will be handled in a matter of hours. Texas and Arizona have both been holding expedited mass trials for migrants. The Intercept obtained images and audio of one such hearing in Texas. It provides a glimpse into what the hearings could be like in San Diego. A New Mexico judge who has handled more Operation Streamline cases than any other in the country told the L.A. Times it was part of why he decided to step down. “See, I have presided over a process that destroys families for a long time, and I am weary of it,” he said. The latest San Diego Explained video delves into the local ramifications of the new zero-tolerance policy at the border. Retail armageddon is raging, killing malls across the country. Downtown San Diego’s Horton Plaza is not immune. People have become prone to calling the downtown shopping mall a ghost town. Even the new Horton Plaza Park has failed to deliver on its promise of getting people back into the mall. And now, one of the mall’s anchor tenants, Jimbo’s, is suing Horton Plaza over lost sales, reports the Union-Tribune. The grocery store’s owners say Horton Plaza has failed its contractual obligations to operate as a first-class regional shopping center, according to the complaint. At one point, the suit cites the fact that the mall didn’t put up holiday decorations as proof it’s not holding up its end of the deal. Everyone’s got a take on what should happen to Horton Plaza. A redevelopment plan is in the works, but a spokesman for Horton Plaza said the company is not ready to announce any details yet. There’s a town hall meeting set for June 20 to discuss the San Diego’s new housing navigation center. The internet can’t get enough of this clip of a Padres fan catching a baseball in her glass of beer, then chugging it. May Gray was gnarly. June Gloom, not so bad just yet. An earlier version of the story detailing SANDAG’s use of the weighted vote incorrectly attributed a statement to Mayor Kevin Faulconer, instead of his spokesman, Greg Block. The Morning Report was written and compiled by Maya Srikrishnan and Kinsee Morlan, and edited by Sara Libby.